Sometimes when you are developing an Excel application you will have one or more Worksheets that you no longer need you will want to delete them. 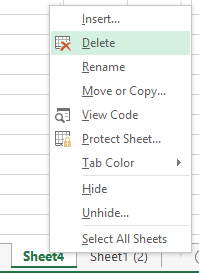 Right click on the name tab for the Worksheet you want to delete to reveal the context menu. You will see a warning about the consequences of deleting the sheet, this is your last chance to change your mind, if you’re sure this is what you want to do, simply click the ‘Delete’ button.